It was ‪#‎ThrowbackThursday AND Ashley’s 3-year anniversary. So, it only made since to reminisce on Ashley’s first event with us. 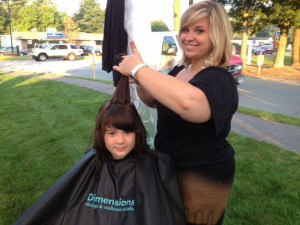 Fox25 News Zip Trip came to our little town, Carver, where we gave free haircuts to anyone who donated a non-perishable good to Carver’s Food Pantry, three years ago. We feel so lucky to have such a passionate stylist and team member who brings so much humor and fun to our Dimensions family. We can’t imagine it without you, Ash! We look forward to seeing what even greater success the future at Dimensions has in store for you. Happy 3 year anniversary!